In any tourist ratings - make them in Russia or abroad - in the highest places always there is an honorable place to St. Petersburg - the Northern capital of Russia. Here come for the romance of the white nights, for Dostoevsky's mysticism, for the classic types of drawbridges. But the townspeople are increasingly eager to show Petersburg's guests the 21st century and its new symbols. The way from the Pulkovo airport to the Vasilievsky Island a couple of years ago took almost an hour and a half. And now - no more than 20 minutes. From the south to the north of the city, a highway is laid, it is called the Western High Speed ​​Diameter. It is definitely worth a trip to the tourist - this is one of the new, high-tech attractions, which have no analogues in any city of Russia. To build this unique road began in 2005. We finished in 2016. 46.6 kilometers is the length of the Western Speed ​​Diameter. 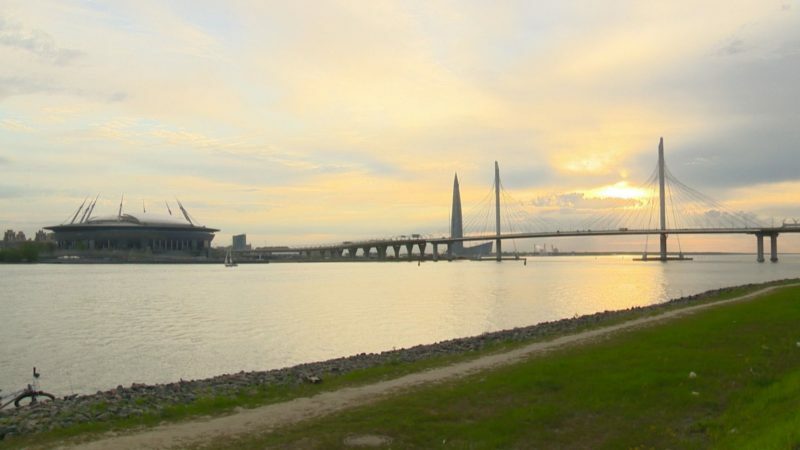 55% of the route is overpasses, bridges and tunnels, including a two-tiered bridge over the Sea Canal, cable-stayed bridge over the Ship's channel in the Neva Bay and cable-stayed bridge across the Petrovsky fairway. 110 km / h - the maximum permitted speed. Journey through the Western Speed ​​Diameter is paid. The motorist will have to pay the amount of 100 rubles - depending on the type of car and the duration of the trip. You can always specify the cost on the official site of the route. A trip along the new route reminds of a popular walk along the rivers and canals of the Northern capital. This is also an excursion, only an automobile tour. And many even try to slow down on the expressway to better see the city from new angles. Thus, "industrial", St. Petersburg could not be seen before - cranes of shipyards, submarines and old factory buildings. Even the WHSD builders admit that they did not expect the "excursion" result of their work: "We can see two very different Petersburgs from the Western Speed ​​Diameter. One Petersburg - in the cable-stayed bridge across the Petrovsky fairway - there is the ceremonial Vasilievsky Island, Krestovsky Island. A completely different view opens from the bridge across the ship's fairway - this is industrial and port of Petersburg, "says Andrei Tsapu, head of the public relations department of the Northern Capital Highway. This new symbol of St. Petersburg was erected for almost 10 years. Changed projects, contractors, complicated technical requirements. But the result exceeded expectations. A flying saucer landed on Krestovsky Island. The football space ship is fully ready to host the 2018 World Cup matches. For the time of Mundial, according to its regulations, the stadium will be called the "St. Petersburg Arena". Here will be seven meetings of the World Cup, including - the game for bronze. Fans from more than 30 countries will come. Here's an opinion about the arena of Fedor Pogorelov, football commentator: "If we talk about the design features, how everything is located here, about the infrastructure - the stadium is unique. This is the only field in Russia, maybe even in Eastern Europe, a retractable field. The stadium under the roof - this is the ultimate luxury - I think, so fans are not pleased in any city. " In case of rain, the sliding roof of the stadium closes in just 15 minutes. 287 600 square meters - the total area of ​​the stadium and park. 9840 square meters - the area of ​​the football field. 79 meters - the height of the stadium. 110 meters - the height of the building, taking into account the pylons. 56 196 people - the total capacity of the stadium. 105 at 68 meters - the size of the playing area. After the football holiday, the toponymic commission of the city will sum up the contest for the best title and only then will the arena receive its official name. Now the stadium is transferred to 49 years of the beloved city sports club - "Zenith". "This is a stadium from the weight category" a very large arena, "continues Pogorelov. - My generation, the children of the stadium "Petrovsky", to this imperial scope accustomed with a screech . This postpones the imprint on the modus operandi of the fans on the day of the game. If you came to Petrovsky for an hour, ill for two hours and 15 minutes after the final whistle you are already in the metro, then here it really is a weekend trip. This event". The new stadium was needed by the city for a long time - only this season there was already a million viewers, every fifth resident of the Northern capital of Russia. In addition to sports events on the arena will be held festivals and concerts. The group Leningrad, led by Sergei Shnurov, is preparing to storm the first new ground in the fall. The schedule of events and any information about the new stadium of St. Petersburg can be found on the stadium's website. This office building bears the name of the area of ​​St. Petersburg on the shore of the Gulf of Finland, where it is erected. Lakhta - so historically called the north-western part of the city. Originally, the skyscraper was planned to be built closer to the center, which caused protests from the city guard and the Petersburg intelligentsia. Now even the most ardent opponents recognize: the place for the new "skyscraper" has chosen the right one: "It does not change the background of this part of the city. It is technological pipes of factories. 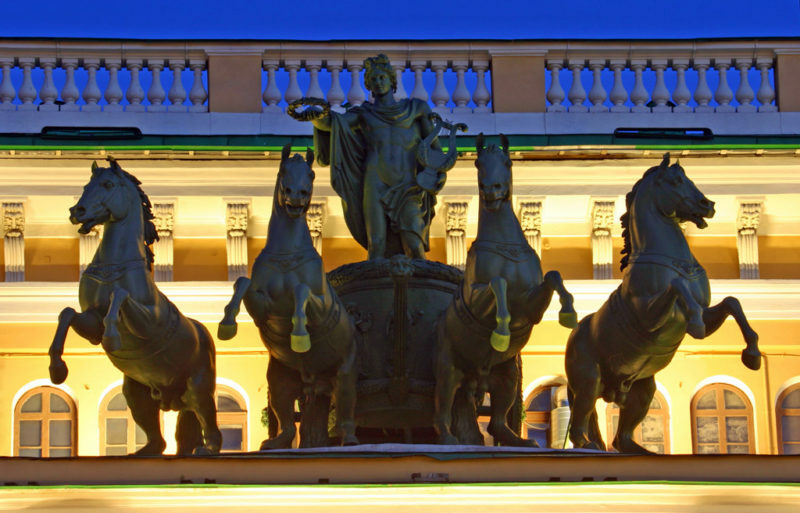 My eye treats her calmly, "says the Director of the State Hermitage Mikhail Piotrovsky. Lakhta Center is the tallest building in Europe. It rises above sea level by 462 meters. This is a complex architectural structure, which was risky to build on the marshy soils of St. Petersburg. But the engineers did a miracle. Dmitry Matveev, chief specialist on metal structures of the IFC Lakhta Center, clarifies: "Before us stood the engineering task of leaning on a densely bearing soil - here it is at a depth of 82 meters. Therefore, under the tower 264 piles, and all under the complex 2080 piles. " Scientific and educational center, trade and recreational zones. The total exposition area of ​​the center is more than 7 thousand square meters. And at the very top of the building, above the clouds, at an altitude of 360 meters, will open a viewing platform. Lift guests to the top will be high-speed elevators - just a minute. The viewing angle is also 360 degrees. So St. Petersburg - both old and new, will be seen as in the palm of your hand.